No Bake Energy Bites are packed with protein and make the perfect healthy snack or breakfast on the go! 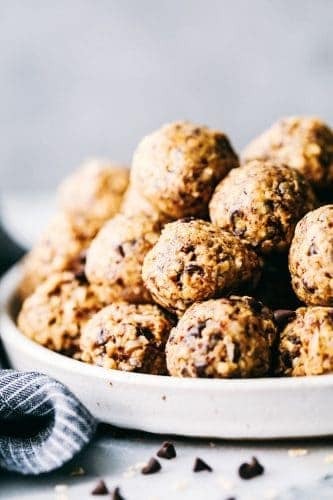 Loaded with oats, flax seed, peanut butter, coconut and chocolate chips, these little bites are amazing! In a large mixing bowl, mix rolled oats, coconut flakes, nut butter, flax seed, honey, and vanilla. Make sure it is mixed well so that you can form the balls easily. Add chocolate chips if using or other desired mix ins. Chill the mixture in the fridge for an hour so that balls will bind together. Roll the balls into about a 1 inch diameter.